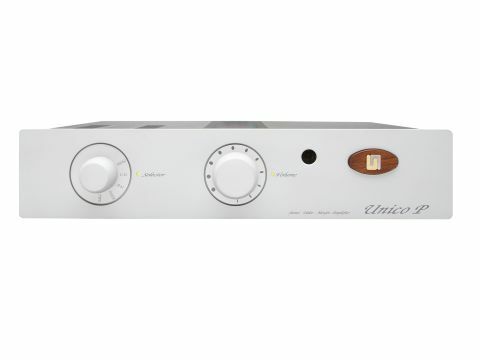 Unison Research is a name very much associated with valves - that, and sumptuous Italian styling. The company's upmarket models are visually striking, and few would deny them the epithet 'gorgeous', too. Unison has inevitably had to make concessions in this, its cheapest amp. Still, the thick aluminium front panel and matching selector and volume knobs give a touch of class that's by no means taken for granted at this price. And given that it features a phono stage as standard, it's clearly no cheapskate on the features front. There's another distinguishing feature inside. A single ECC82 (a double triode, one section serving each channel) doesn't make this in any very meaningful sense a 'valve amplifier' but if it gives a touch of valve sound that appeals, we won't sniff at it. In any case, it's assisted by an assortment of semiconductors, including a low-noise op-amp doing duty in the phono stage, bipolar transistors at various points and MOSFET output devices. Power for all that lot is sourced from a medium-size toroidal transformer aided by a couple of unusually large smoothing capacitors. As with most modern integrated amps, two internal heatsinks get rid of waste heat and the main circuit board is mounted to one side of them, with a couple of 'daughterboards' increasing the available area. All audio parts are through-hole types, with a handful of surface-mount components looking after the remote control functions - in this case that means just volume as the selector switch (located at the rear and operated via a long shaft) is not motorised. This amp scored a clear hit with all our listeners. It seems to have ticked all the boxes, and what's more the impression it made started well but got better. The praise began cautiously, with a warning note about slight veiling, but by the third track comments were uniformly positive. Almost every important area of sonic importance received some specific praise. Tonality, it was thought neutral and well extended at both ends of the spectrum, with good bass weight and clarity. Dynamics were wide but not exaggerated, and it's always a good sign for long-term listening comfort when this is matched by a natural flow from soft to loud and back again. And rhythm was likewise clear and easy to follow without unduly dominating proceedings. That's not to say that every aspect is best in class. Imaging was praised for its fine lateral resolution, but its depth performance was, we felt subsequently, perhaps the one weakness of the amp - it has vague definition of the distance at which performers are placed from the listener. In all honesty, though, this is not very distressing and probably barely noticeable under any circumstances short of critical comparison with other fine amps, using familiar recordings. Detail was well liked by our panel, and while it might not satisfy real analysis freaks, we rate it very highly, not least for the unfussy manner in which is it presented. If you don't want to take a recording apart, this amp won't force you to. It's an informative and highly listenable model, which deserves every success.